The combined editorial experts from HealthLeaders Media and HCPro have come together to bring insight and news on every aspect of the revenue cycle into one daily resource, the Revenue Cycle Daily Advisor. Register now for your free e-newsletter! Hospitals, health systems, and physician practices face constantly changing regulations, heavy government oversight, and complex rules for reimbursement, yet they’re asked to find new solutions and efficiencies for everything from patient registration to discharge—and everything in between. And because of payment reforms and value-based care initiatives, these issues are more pressing than ever. 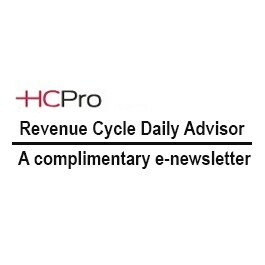 The Revenue Cycle Daily Advisor is here to help. The combined editorial experts from HealthLeaders Media and HCPro bring together news and insight on every aspect of the revenue cycle in a single publication, delivering it to your inbox daily. CLICK HERE for a sample issue of Revenue Cycle Daily Advisor.